Not to be confused with Eastern Hemisphere. 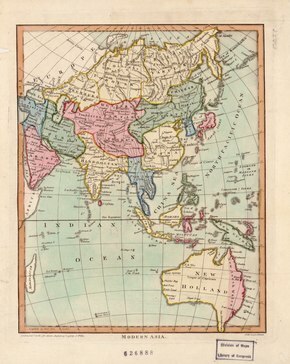 The Eastern world in a 1796 map, which included the continents of Asia and Australia (then known as New Holland). 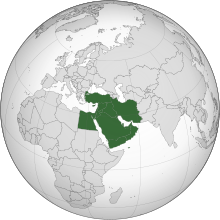 The term Eastern world refers to various cultures or social structures and philosophical systems depending on the context, most often including at least part of Asia or geographically the countries and cultures east of Europe, the Mediterranean Region and Arab world, specifically in historical (pre-modern) contexts, and in modern times in the context of Orientalism. The term is usually not used by people in this region itself, since this Eastern world is a varied, complex and dynamic region, hard to generalize, and although these countries and regions have many common threads running through them, historically they never needed to define themselves collectively against another entity, real or superficial. The term originally had a literal geographic meaning, referring to the eastern part of the Old World, contrasting the cultures and civilizations of Asia with those of Europe (the Occident or Western world). Traditionally, this includes all of Central, North and East Asia (the Far East), Greater Middle East, Southeast Asia and South Asia (the Indian subcontinent). Conceptually, the boundary between east and west is cultural, rather than geographical, as a result of which Australia is typically grouped in the West, while Islamic nations and much of the former Soviet Union are, regardless of location, grouped in the East. Other than Asia and some parts of Africa, Europe has successfully absorbed almost all of the societies of Oceania, and the Americas into the Western world, Turkey, the Philippines, Israel, and Japan, which are geographically located in the Eastern world, are considered at least partially westernized due to the cultural influence of Europe. Although the concept of a united Asian people and not mean Asian race is even more debatable due to the fact that most of the world link the identity of Asian only to the people of South, East and Southeast Asia and so regions like Western Asia that who even though see themselves as part of the Eastern world such as the Arab nations of Western Asia, Israel, Turkey, Iran, and the ethnic groups that come along with these countries do not identify as Asian. Another reason why a Pan-Asian identity is a flawed work in progress concept compared to the mass unity found in the continents of Europe and Africa is the fact that Asia is the most racially and ethnically diverse continent in the world that differs very widely among and within its regions with many different cultures, environments, economics, historical ties and government systems whose people have an even further pan-continental belief of nationalistic, cultural, and ethnic individualism many of whom believe came out of the imperialistic colonization of the continent by foreign Western powers back in colonial times and because of this overt sense individualism across the continent once a specific group(s) is labeled something many groups within Asia will have a hard time identifying with the same label. Most of the people of Asia prefer to identify with their individual nations rather than with their continent, region, or each other and these attitudes can be found throughout the continent. The division between 'East' and 'West' is a product of European cultural history, and of the distinction between European Christendom and the cultures beyond it to the East. With the European colonization of the Americas the East/West distinction became global. The concept of an Eastern, "Indian" (Indies) or "Oriental" sphere was emphasized by ideas of racial as well as religious and cultural differences. Such distinctions were articulated by Westerners in the scholarly tradition known as Orientalism and Indology. An intriguing fact to be noted is that Orientalism has been the only Western concept that was about a unified Eastern world and not about any specific region(s), but rather all of Asia together. During the Cold War, the term "Eastern world" was sometimes used as an extension of Eastern bloc, connoting the Soviet Union, China and their communist allies, while the term "Western world" often connoted the United States and its NATO allies such as the United Kingdom. The concept is often another term for the Far East – a region that bears considerable cultural and religious commonality. Eastern philosophy, art, literature, and other traditions, are often found throughout the region in places of high importance, such as popular culture, architecture and traditional literature. The spread of Buddhism and Hindu Yoga is partly responsible for this. The spread of Syriac Christianity to Eastern Asia. Distribution of Eastern religions (yellow), as opposed to Abrahamic religions (violet). Christianity — the majority of the modern world adheres to this faith although it isn't widely practiced in its native continent of Asia anymore and since the faith had spread to the Western World the notion of "Europe" and the "Western World" has been intimately connected with the concept of "Christianity and Christendom" many even attribute Christianity for being the link that created a unified European identity. Nonetheless, vibrant indigenous minorities in the Levant have preserved their ancient beliefs, adhering to Syriac Christianity (i.e. Assyrian and Maronite people), an Eastern Christian sect. Islam — the majority of the world Muslim population have always lived in Asia, due to Islam spreading and becoming the dominant religion of these areas. Judaism — the national religion of the Israelites/Hebrews of the Fertile Crescent, or what is now Israel, Palestine, Jordan, Syria, and Lebanon. They eventually evolved into the Jews (particularly Ashkenazi, Sephardic, Mizrahi) and Samaritans of today. Buddhism — the path of liberation attained through insight into the ultimate nature of reality. Sikhism — a religion that developed in the warring plains of Punjab in an atmosphere of ideological clash between Islam and Hinduism. Its followers retain spiritual as well as martial qualities. Confucianism — the belief that human beings are teachable, improvable and perfectible through personal and communal endeavour especially including self-cultivation and self-creation. Kebabs are a popular cuisine among Middle Easterners. Sushi has become prevalent even among westerners. Armenian khash (or pacha), which is also commonly eaten by Assyrians, Arabs and Kurds. Ramoji Film City located in Hyderabad, holds Guinness World Record as the World's largest film studio. A Hindu temple in Sri Lanka. The Tian Tan Buddha statue in Hong Kong. Temple of Confucius in Liuzhou, Guangxi. The Western Wall and Dome of the Rock in Jerusalem. Great Mosque of Mecca in Saudi Arabia. Color drenched Gopis during the Holi celebrations in Krishna Temple, Mathura. ^ Thompson, William; Joseph Hickey (2005). Society in Focus. Boston, MA: Pearson. 0-205-41365-X. ^ Meštrovic, Stjepan (1994). Balkanization of the West: The Confluence of Postmodernism and Postcommunism. Routledge. p. 61. ISBN 0-203-34464-2. ^ "Embassy of Brazil - Ottawa". Brasembottawa.org. Archived from the original on 2011-04-29. Retrieved 2011-05-06. ^ Falcoff, Mark. "Chile Moves On". AEI. Archived from the original on 2009-04-17. Retrieved 2011-05-06. ^ Sheldon Kirshner (2013-10-16). "Is Israel Really a Western Nation?". Sheldon Kirshner Journal. Retrieved 2013-11-09. ^ "EU-Turkey relations". European Information on Enlargement & Neighbours. EurActiv.com. 23 September 2004. Retrieved 26 August 2008. ^ "Fifty Years On, Turkey Still Pines to Become European". TIME. 8 September 2009. Retrieved 8 September 2009. ^ Khatib, Lina (2006). Filming the modern Middle East: politics in the cinemas of Hollywood and the Arab world. Library of Modern Middle East Studies, Library of International Relations. 57. I.B. Tauris. pp. 166–167, 173. ISBN 1-84511-191-5. ^ Cartmill, M. (1999). The Status of the Race Concept in Physical Anthropology. American Anthropologist 100(3)651 -660. ^ For example, "Asian and Indian people" are referred to in the New Zealand Heart Foundation's BMI calculator Archived 2009-05-31 at the Wayback Machine. ^ "Ramoji Film City sets record". Business Line. Archived from the original on 8 December 2008. Retrieved 3 August 2007.